The following Mile-by-Mile Guide has been excerpted from California Whitewater by Jim Cassady and Fryar Calhoun. 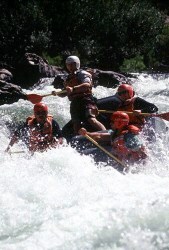 Visit the "About the Books Page" for more information about this California whitewater rafting guidebook. Mile 0 -Meral's Pool; Put-in: There are two good put-in sites on the left bank. A flow gauge is located at the rivers edge, and a conversion chart is on the bank above it. Kayakers who want to run an extra rapid sometimes put in upstream at Lumsden Campground, but this alternate put-in is a little difficult for rafts. Another put-in is farther upstream, just below Lumsden Bridge (see Cherry Creek run). Mile 0.1 - Rock Garden (Class IV): This boulder slalom is toughest at low water, when rafts usually have to cross from right to left part way down to find a runnable channel. At very high flows there is a dangerous reversal at the bottom. Mile 0.4 - Nemesis (Class IV): Another low-water nightmare just after a sharp left-hand bend. The Nemesis is a big boulder cluster about half way down. At low flows there are no clear routes, but it is safest to run left of the obstacle. Mile 0.8 - Sunderland's Chute (Class IV+): At the end of a short pool, the river turns sharply right and tumbles down a rough chute . The current pushes boats toward a big rock (hole at higher flows) guarding the right side. Scouting from the right involves a difficult clamber over huge boulders and around poison oak. Wear your life jacket--securely fastened--when you scout. Mile 1.0 - Hackamack Hole (Class IV): A sharp drop divided by two big rocks. At high flows they form a river-wide reversal that is hard to miss. Mile 1.5 -Ram's Head (Class IV; V above 3500 cfs): The river bends left and drops down a rocky pitch whose exit is plugged by a boulder. At medium and high flows the boulder creates a powerful spouting hole. Fortunately, there is a good recovery pool below. Stop well upstream to scout from either bank. Walk all the way down to look at the bottom of the rapid. Mile 1.9 - 2.1; India & Lower India (Class IV): Two shorter chutes separated by a small pool. Both finish with sharp drops plugged by big rocks--at high water, river-wide holes. Scout both rapids at the same time from river left. Mile 3.3 - Tin Can Cabin (river left) is sometimes used by fisherman who hike down a steep trail from Lumsden Road. Mile 4.4 - Sterns (Class IV): At low flows, big boulders blocking the river create a problem for rafts, which must run a narrow chute between the left wall and a van-sized rock. Don't get turned sideways! Mile 4.7 - Evangelist (Class IV): The river bends right into a series of short drops with a big rock/hole right of center. Mile 5.4: At the end of a long pool, the Clavey River enters from the right, and the Tuolumne turns sharply left into Clavey Falls, the biggest rapid on the run. Small Campsites on both banks of the Tuolumne. A trail leads from the left bank downstream and then out of the canyon. Good hiking (with poison oak) and fishing up the Clavey, but both activities are dangerous at high water. When the Clavey is running high, it can be difficult to get rafts across its mouth in order to eddy out on the right bank of the Tuolumne above the Falls. Mile 5.4 - Clavey Falls; Possible Portage (Class V): The first two drops in this dramatic staircase rapid are the biggest. The first, an eight-foot vertical called "The Falls"' takes boats into a foaming current that pushes them into the left wall. The second drop is guarded by a boat eating hole across the left half of the river. 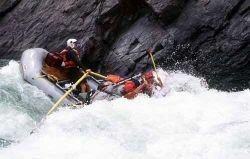 Rafts have a hard time avoiding it at flows above 2000 cfs. Kayaks can choose alternate routes that avoid most of the problems. When boats run the Falls, station rescue parties downstream. Portage on the right if you don't like the looks of this rapid. Mile 5.9: The trail that begins above Clavey Falls climbs out of the canyon to Ferretti Road from above the left bank. Mile 7.5: Powerhouse Campsite, a big sandy beach, on the right. The powerhouse provided electricity for miners early in the century and was destroyed by flood in 1937. A trail on the left bank leads downstream to Indian Creek and then out of the canyon. Mile 7.9: Grapevine Creek enters from the right. Grapevine Campsite is downstream on the left. Mile 8.2: Abandoned hard rock mine shaft on the left. Mile 8.3: Indian Creek enters from the left. An old road climbs out of the canyon from a point just downstream. Large campsite on river right. Mile 9.5 - Gray's Grindstone (Class IV): At the end of a long pool, boulders block the left side of the river and announce the beginning of this thoudand-yard maze. At high flows a big hole hides in a row of standing waves just below the top of the rapid. Mile 11 - Thread the Needle (Class IV): Rocks block most of the river. Even at low flows, boaters are advised to take the "Chicken Shot" on the left rather than attempt to "thread the needle" between the rocks in the center. Two campsites on the left in the next half mile. Mile 12.2: Quartz mine shafts on both banks were abandoned around 1909. A huge steam engine (river right) is worth a look. A trail leads out of the canyon from river left. Mile 12.6 - Cabin (Class IV): Big Humbug Creek enters from the left. The river bends right and drops down a curving chute with a big rock/hole just below the entrance. Mile 12.8: Big Creek enters from the left. A short hike up the creek leads to a nice waterfall. Indian mortar holes near the creek's large mouth. Large campsite. Mile 12.9 - Hell's Kitchen (Class IV): A wide chute is almost blocked by a boulder jumble extending out from river right. There is a runnable slalom course down the left side, made even tighter in recent years by a snag caught on a rock. Mile 14.4: Tattered suspension bridge marks the site of the abandoned Mohican and Mary Ellen quartz mines. Old mining equipment, including a stamp mill, on the left. The Mohican trail leads out of the canyon from river left. Mile 15.1: North Fork of the Tuolumne enters from river right. Good campsites from here on. 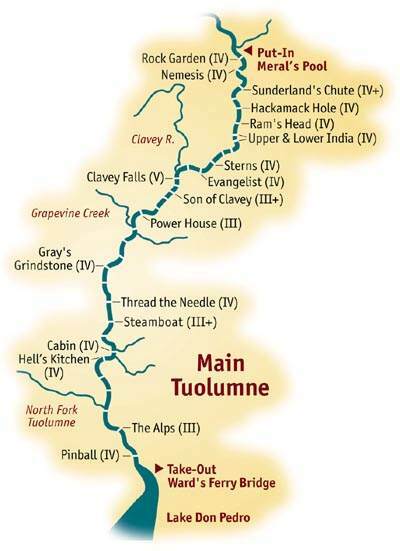 A mile up the tributary is the site of an old bridge, Devil's Gate which once linked Tuolumne City with the Mohican Trail via the suspension bridge upriver. Mile 15.8: High-water mark of New Don Pedro Reservoir. When the reservoir is low, more whitewater action lies ahead. Mile 16.5: Turnback Creek enters on the right. It's name commemorates a discreet strategic location made by 2 miners who stumbled upon an Indian camp. This creek was the site of an intense gold rush in 1856. Mile 17.5 - Pinball (Class IV+): One of the best rapids on this run, almost in sight of the take-out, is usually covered by the reservoir. When Pin Ball emerges, boaters must find routes over a river-wide ledge guarded by a jumbled boulder fence. Mile 18 -Take-Out: Ward's Ferry.